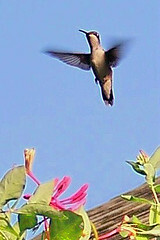 It's always a thrill to see a hummingbird in the garden! Hummingbirds visit my garden from March through September. It is easy to attract them to your yard. Just grow a variety of plants with brightly colored flowers. It's a good idea to use several kinds of plants that bloom at different times to provide flowers throughout the growing season. Tubular flowers usually contain large amounts of nectar for the hummingbirds to sip. These plants are easy to grow in North Florida, and are definitely hummingbird magnets! Red Buckeye is a small native tree with showy red flowers. Coral bean is a native plant with striking red flower spikes in the spring, and showy red seeds in the fall. Texas Sage is a colorful hummingbird magnet all season long. Cypress Vine is a delicate annual morning glory. Coral Honeysuckle is a beautiful native vine with tubular red flowers.